Manhattan may be an ethnic melting pot but is in reality a collage of neighborhoods. Harlem runs from 96th to 155th, and Washington Heights comprise 156th to about 190th. Ellington’s famous “Take the A Train” was, and still is, the major North/South connector including a jog over (under) to Brooklyn. Lin-Manuel Miranda’s “IN THE HEIGHTS” captures the spirit of immigrant Latinos settling into a ghetto of familiar and shared socio-economic environment. All iterated as a rap musical. His depictions of the relationships, both major & minor, exemplify not only newcomer situations but intergenerational disagreements as well. Illustrating such requires effusive lyrics clearly conveyed and expressively projected. Kimelman’s cast conveys both, coupled with elaborate and certainly energetic dance numbers. The set by Kelly Wolf captures the ambiance of the ‘hood as do her costumes. The plotlines deal with financial struggles; deep-seated cravings for improvement and love between different cultural backgrounds. Kimelman never preaches, just illustrates. His parental disappointment scenario reeks of identification without moralizing. His illustration of a community coming together in times of duress and sorrow never becomes saccharine. The narrator and lead character is Usnavi (U.S. Navy) who runs a bodega. He’s an orphan but mothered by the barrio’s matriarch Abuela. Usnavi is crazy about Vanessa who works at the local hair salon run by Daniela. The Rosario family operates a cab business and have pinned their hopes on daughter Nina who has just returned from Stanford; the first localite to attend University. She’s adulated by Benny, a WASP who works for her parents Kevin & mother Camila. Fortunately, Alex Kelly’s Usnavi is understated so his character comes across as real rather than heroic. Kelly demonstrates a myriad of emotional range from shyness to determination as well as disappointment and sensitivity. Aisha Jarvis is his Vanessa and her terpsichorean talent is outstanding. The pivotal role of Nina Rosario is played by Vanessa Sears who earns audience empathy from the moment she appears on stage. A Stanford failure, the emotional stress she faces in telling her doting parents is tangible and visceral. Her solos as well as duets with Benny illustrate an amazingly pleasing vocal range and clarity. There are strong support performances by Laura Harding as Mrs. Rosario; Nina’s mother who morphs from subservient to lioness defending her cub; Nik Murillo is Kelly’s cousin & spokesman ‘Sonny’; Rachel Delduca is a credible stereotypical ‘dumb blonde; while Alison Wither contributes a strong ‘Abuela’ interpretation. Eric Dahlinger’s ‘Graffiti Pete’ has to present some acrobatic dancing while wearing a backpack… amazing. Wish he hadn’t tagged his sprays with “D G”, I swear I’m not guilty of effacing the cab company! There are two other character standouts that totally own the show. Benny is played by J J Gerber and he is a triple threat. His acting is as good as it gets; his singing is faultless and he can dance up a storm. His Act II scenes where we find out that he & Nina were intimate & his dialogues with her father are about as professional as theatre gets. The proprietor of the salon is Kimberly Truong and her Daniela is a terpsichorean dynamo. She is an impeccable dancer whose mobile face underscores every emotion she’s projecting. The lady actually sparkles. Both actors possess that certain intangible that is usually called ‘star quality’. This clairvoyant guarantees that Gerber & Truong’s names will be prominent on future playbills &TV credit listings. 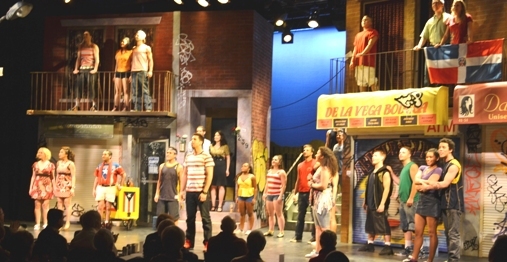 “IN THE HEIGHTS” is at Sheridan until March 1st. Recommend it highly!